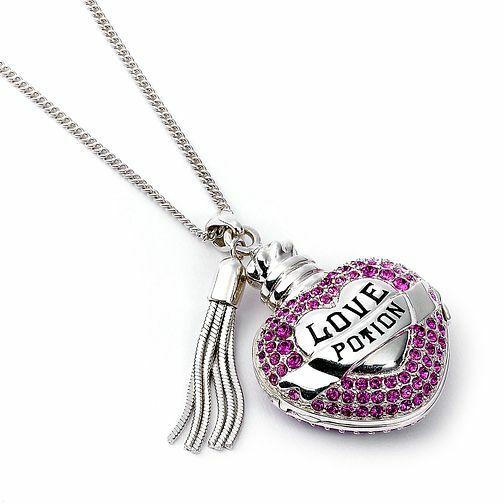 Harry Potter fans will be falling head-over-heels for this enchanting necklace! Wonderfully crafted from silver, a fine chain presents a traditional heart shape charm which boasts the styling of the favourite film franchise's love potion. Glistening pink swarovski crystals add a stylish splash of colour, with a silver tasseled finishing touch. Store photos of your nearest and dearest by opening the locket. We boast only the highest of quality for our Harry Potter pieces, packaged in a Harry Potter giftbox perfect for presenting to a Potter Head!